« Everglades National Park, November 11, 2007. Jenn convinced me to go out to Utah and check out some national parks over Thanksgiving weekend, 2007. We were planning to hit up Zion, Bryce, and Capitol Reef but we only ended up making it to the first two. Jenn and myself and her dad drove out from Pasadena on the evening of November 20, 2007. We got as far as Las Vegas, and staked out in a motel. We got a pretty early start the next morning and poured a mostly sleeping Jenn into the car, and headed off towards Utah. My first time! Well, other than a layover in SLC, which just doesn’t count. We got to the park around noon on the 21st, and set up camp at Watchman Campground, conveniently open year round. Anyway, I’d like to preface this with the simple fact that Zion is gorgeous. The day we got there, we did a nice easy hike to the Emerald Pools. This whole walk is 3 mi RT, with 350′ of gain, so really more like a nice sashay. 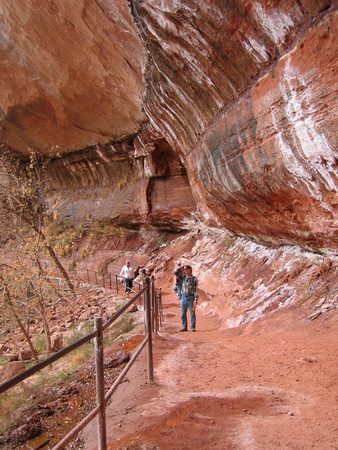 It starts pretty easily from the canyon floor and heads out along paved trail to the lowest of the three pools. This has falls coming down from the pool above it, and you walk along underneath this crazy huge ledge, behind the waterfall. The pool itself didn’t have all that much water in it, but walking under the ledge was crazy. Then you sort of loop back, cutting up amongst these large rocks, getting to above where you just were, at the middle pool. There were a bunch of kids playing here, and a large barrier at the edge, warning you to please not manage to throw yourself over. We stopped there for a little bit, then continued on to the upper pool. The trail to the first two pools is a loop and there is a spur off to the third pool. This part was a little bit steeper than the prior part had been, but nothing too bad. There was a kind of ridiculous cairn someone had built along the way, and when we got to the third pool, there was kind of a creepy blair witch figure laid on a rock made out of licorice. After continuing along and ducking around and past some rocks, you come to this dead end, with enormous cliff walls towering over you, inducing in me some sort of…whatever the opposite of vertigo is. Either way, looking straight up was pretty downright weird. We stayed up there a bit, looking at the pretty pool and the walls, and then made our way back down. Then, much to my surprise, we found ourselves camping next to a couple people I knew from LA! I was all “…that looks like Brian. huh. Wait…That looks a lot like his wife Sarah…holy cow!”. We grabbed some sunset snapshots , made dinner, and went to bed. Our main goal the next day (Thanksgiving!) 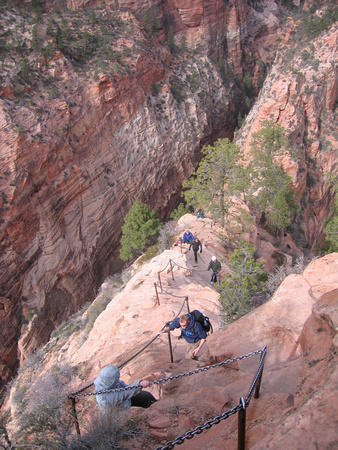 was to go up to Angel’s Landing. This is a very classic hike, kind of one of the must-do’s – and as such was concomitantly crowded. But that’s cool, most must-do’s are still pretty awesome. I was a little nervous going into this one, since I had heard how frightening it was, but really it just didn’t turn out to be all that bad. Anyway, this chunk is 5 mi RT, with just under 1500′ of gain. It starts out pretty easily , just heading along the base of the canyon, walking along the river. Soon it turns into switchbacks cutting into the hill. The thing that was a little weird to me is that this (and a lot of other trails in Zion) are actually sealed with concrete. Pink concrete, go local pride. While in some ways it detracts, in others it helps a lot. Since the climate is so dry , it means you get “dry dry dry BUCKETS OF RAIN dry dry dry” which means that on several occasions of the year, the trails would carry torrents of water. 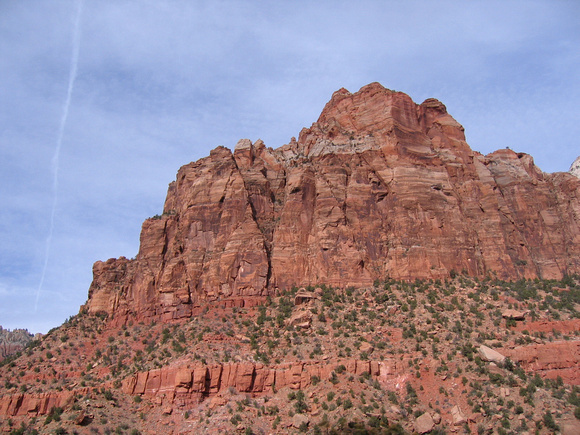 And since the rock is mostly sandstone, it would get eaten away pretty quickly. So the concrete keeps everything in place. It also adds some helpful traction, but let me tell you, concrete is pretty hard to hike on. After a few of these switchbacks, the trail turns into Refrigerator Canyon, which is shady and pleasant as the name suggests. This is a (flat) welcome respite. After heading along this side canyon for a bit, you make an abrupt about face, and head up the well-known “Walter’s Wiggles” which is a set of very short little switchbacks. The aerial photos of this section are really kind of cute. Right after this section, you get to a landing area. There is a solar toilet, a railing with a nice viewpoint, and a turnoff both for the West Rim Trail (which is what we were sharing the up with) and for the rest of the trail up to Angel’s Landing. This is where they strongly recommend that you turn back if you’re going to have any sort of problems, since the nice paved trail ends here, and the narrow climby long drop part of the trail begins. Many people did stop, but we (and many others) continued on our merry way. In my mind, this is where the trail starts to get really fun! The trail is narrow, and wonderful. 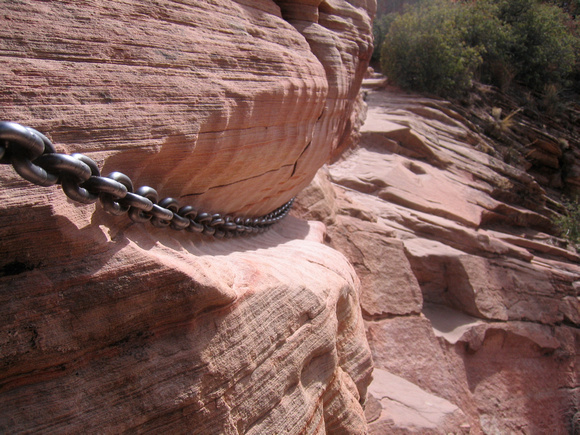 There are many locations where they have chains bolted into the rock, so anywhere that was even a hair sketchy you had a giant chain to hold onto. The weather was great, the sky clear, and the rock was really grippy, so that even though a lot of people turned back in nervousness, I always felt very safe, even though I’m not a huge fan of heights. Even though you could see many places where the chain had dug into the very soft sandstone. Anyway, the walkway was always at least a few feet wide, enough for real walking instead of mincing stepping, and there really were handholds in all the questionable place. We ran into a couple who said they do it every year…and were doing it this year with a baby in a baby carrier. they did say it might be harder once the kid is a toddler. The view is really spectacular once you make it to the top, though there were a lot of people. I guess Zion on Thanksgiving is a popular destination! I would have to imagine it’s often pretty crowded, but it was still somewhat strange to come out to the crest and see a whole mess of people. I guess I don’t often do these “premier” kind of hikes – but it wasn’t *that* easy, so , who knew. But I guess that even though it is marketed as being “very strenuous” it really isn’t that terrible, and it’s only 5 miles round trip. We stayed for a few minutes at the top, but Jenn’s dad had stayed at the junction, so we turned around pretty quickly. After rejoining him, we just headed back down without incident. Seriously. Do not fall off. We weren’t quite done after that, so we did 2 miles of the river walk. 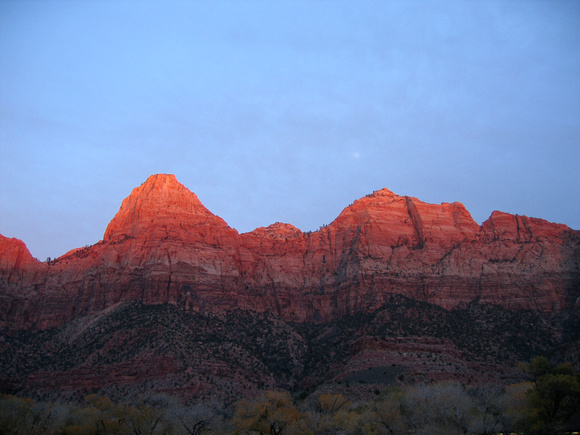 For this, basically you take the road within Zion as far as it goes, and then start, well, walking. This area is called the Temple of Sinawava, another of the truly fabulous Mormon names. From there there is a bit of trail that runs alongside the Virgin River for about a mile, and ends where the Zion Narrows “Trail” begins. Namely, it ends where you have to start walking in the river to actually continue 🙂 It’s a nice little walk, well populated. At the end of it, it’s fun to start looking and seeing how the canyon really starts to narrow a lot, but you can’t see that much more than that. I’d really like to do the Narrows some day; it seems like it would be particularly awesome. And that night we had dinner at the Zion Lodge for Thanksgiving! It wasn’t world changing, but it was a pretty good Thanksgiving buffet.